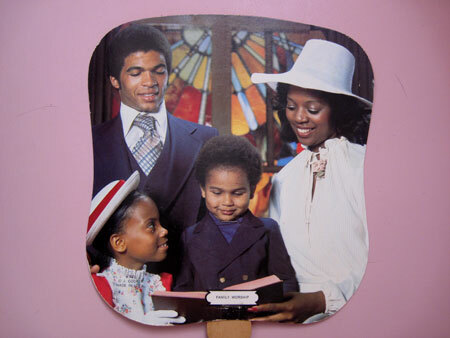 I bought my first African American church fan in the late 1970′s but my collection really kicked into gear after I worked with James Brown in the mid-80s. He always told me my music was so hot and picked up the fan to “cool himself down”. So after that I always bought the fans when I saw them cheap enough. 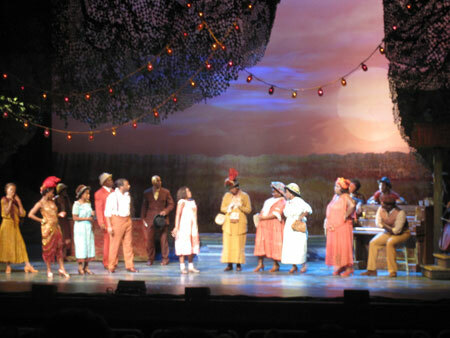 But the collection blasted into overdrive when I began writing The Color Purple musical in 2001. The very first time Alice Walker, the author of the original book, came over I gave her her choice of over 50 fans. I used them all the time with Brenda Russell and Stephen Bray, my music co-writers, but sadly can’t seem to find any photos of us cooling ourselves. 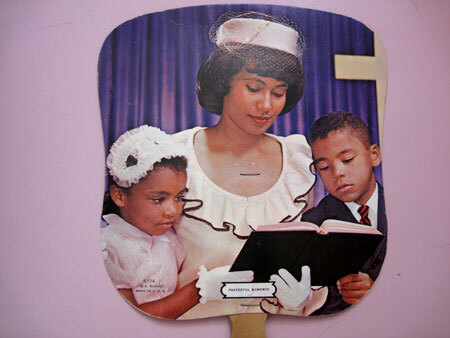 But anytime anyone came over to hear any of the music they always listened with church fan in hand. 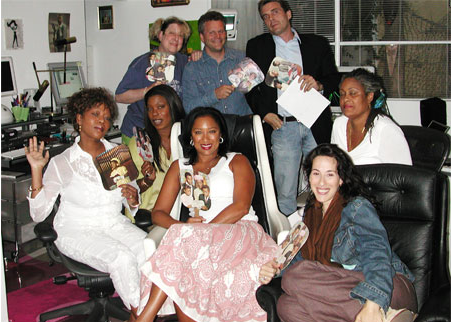 I think we had just finished one of the Church Ladies’ songs when this group, including Alfre Woodard, Lorraine Toussaint, Stephanie Burton, Peter Hastings, Roderick Spenser and Maggie Wheeler (Janice on Friends), came over. 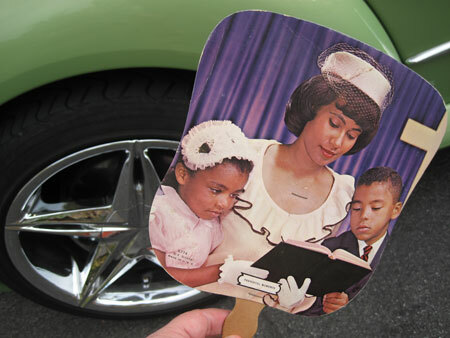 As often as they came from churches, the fans were also a hot promotional item given out by funeral homes. 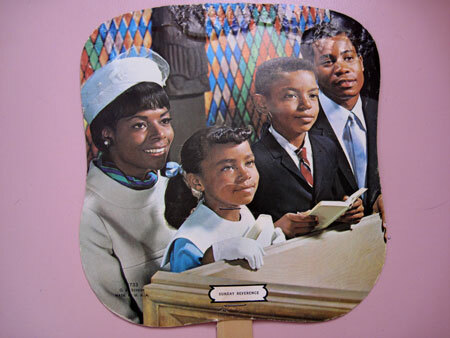 They usually portrayed a gorgeous, dressed in their Sunday best, peaceful looking, happy family. 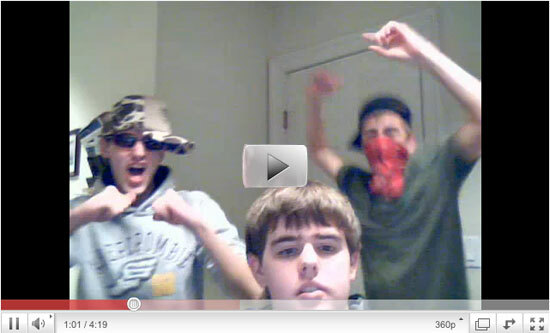 The fans I’m featuring today aren’t necessarily my favorites so much as I love that they all feature white hats. This first one comes from the Brown & Robertson Funeral Home in Picayune, Miss. 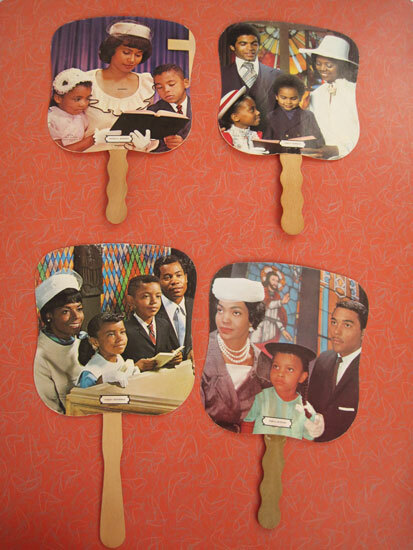 According to the back of the fan, they offer “A Dignified Service in a Sympathetic Way”. This next one comes from the Jones-Gaines & Sons Funeral Home in Topeka, Kansas, “Serving Topeka Area Families With Over 51 Years of Courteous and Efficient Service”. This one’s courtesy of the Dykes Funeral home in Covington, VA. “Consideration for the Living–Reverence for the Dead”. 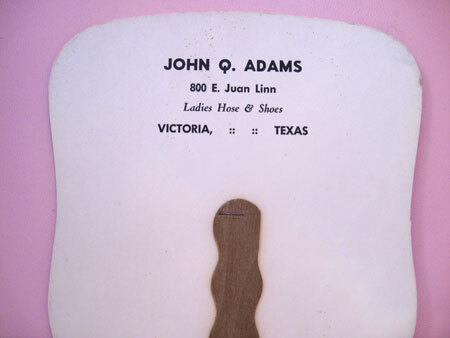 And finally there’s this one from John Q. Adams of Victoria, Texas that says simply “Ladies Hose & Shoes”. I’m assuming that that does not refer to a selection in the funeral home so I guess the fans were available to any business that wanted to hand them out. 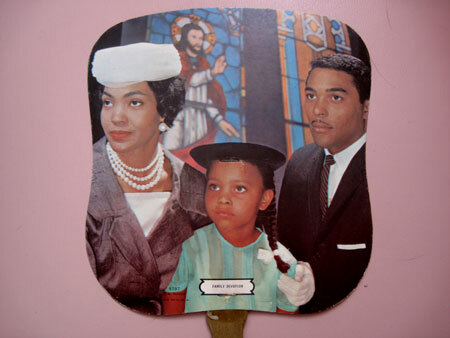 I took a fan with me last night when I crawled along the 101 to Thousand Oaks to see the Second National Tour of my musical, The Color Purple. After 2-1/2 years on Broadway and a three-year First National Tour, this was going to be my first time seeing this all new production and cast. There was a huge traffic jam on the freeway for about 7 miles because of an accident on the other side. Los Angeles has just gotten over record-breaking heat so people were a little more cuckoo in their cars than usual. 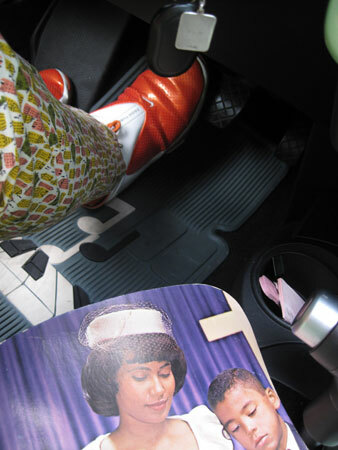 I stayed cool because I had my fan and sensible shoes for driving. I wish I could say that the show was fantastic but I ended up staying in my car on my Ipad for most of it because an idea I’ve been attempting to massage out of my head for several weeks finally decided to spill out while I was in line at Weinerschnitzel. 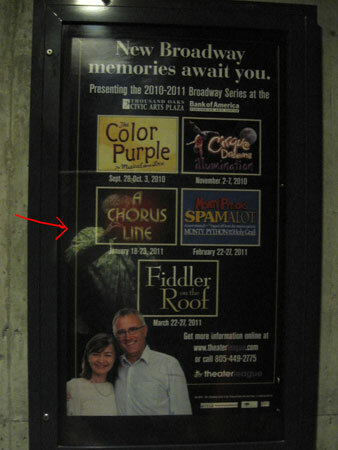 So I spent most of Act 1 pounding away in a parking lot under the glow of the yellow W neon. Having driven all the way to Thousand Oaks though, I made myself get to the theater. I walked in during “Uh Oh”. But this idea kept smacking against the front of my brain and I couldn’t open my Ipad in the theater because the last thing I wanted to do was distract anyone in that audience from what was going on on stage. 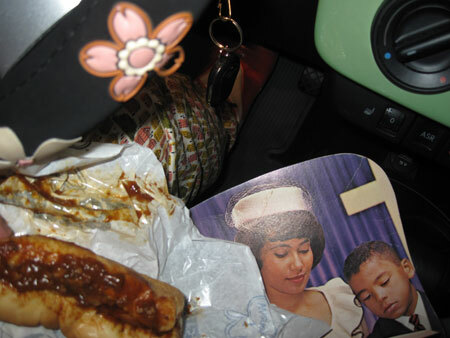 So, knowing I had tickets to see the show the rest of the week, I joined my now-sitting-in-the-car-way-too-long-to-eat Wienerschnitzel and fan and headed back home. /// Maybe the person shooting this video was racing back from the bathroom or had their hands occupied unwrapping candy so they wouldn’t make noise during the performance, but between the front of the song being cut off and the camera doing a tour of the wall, this version of my song, “September”, as seen through the binoculars of kitsch, gets off to an auspicious start! I’m going to also assume that the shooter is related to one of the horn players as no one else in the large ensemble is visible until midway through the first chorus. 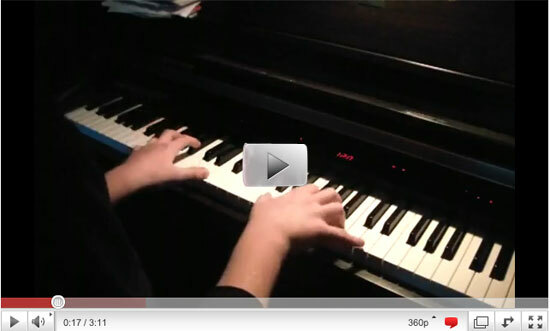 The “walk on” at :23 is really good too. 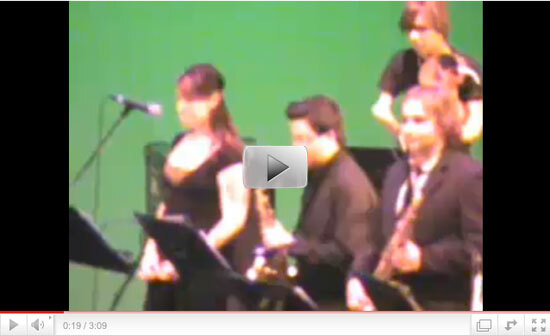 Then the YouTube description says that this is performed by “one of Gramt MacEwan’s showcase bands”. I’m assuming that the shooter’s hands were also otherwise occupied multitasking when they typed that as I’m pretty sure that Gramt is Grant. 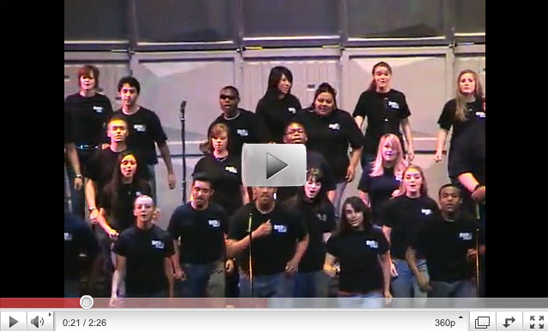 When all is said and done though, this is one of the better school performances of “September” I’ve seen. 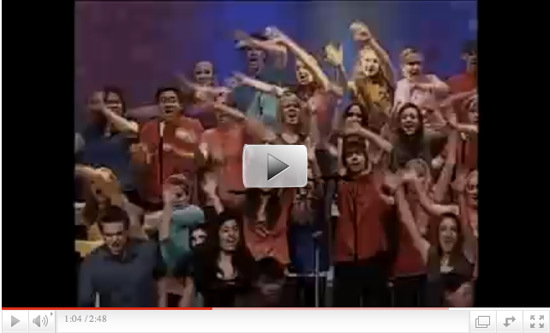 Everyone’s in tune and the cowbell coming in for the last choruses is always good. 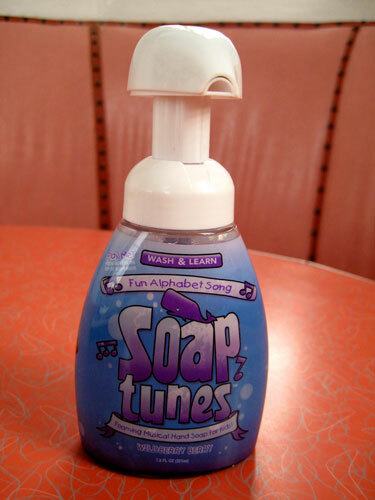 The concept of this “Foaming Musical Hand Soap for Kids!” is really crazy. Theoretically kids can “wash & learn” at the same time. But the biggest thing they’re going to learn is that the quality of the speaker in this thing is so poor that the only one who could possibly hear the music clearly is an insect who somehow slipped through one of the speaker holes and got trapped in the goo, forced to listen to the nearly inaudible and annoying little gremlin voice singing something about washing around your face and continuously spelling S-O–A.–P. I was never into The A-Team when it came out in the 1980′s. But lately, as I flip through channels in the wee hours of the morning trying to find something to fall asleep to, I’ve gotten completely obsessed with the reruns on Centric. I love all the low camera angles as truck tires screech by and slam dirt into the camera and explosions blow up right in your face. The direction has a clear POV and things that hover near the ground get as many close-ups as the actors do. 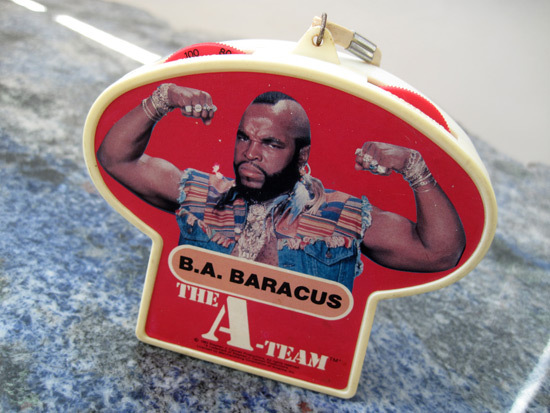 And, of course, there’s always Mr. T, whose memorabilia I’ve slowly but surely collected over the years – banks, gold chain bubblegum, coloring books, puffy stickers, lunchboxes, air fresheners, and this Mr. T radio I recently received as a gift. Every Sunday morning growing up the ritual was to go with my dad to the deli and buy bagels, lox, cream cheese, tomatoes, onions and white fish, the latter of which I never liked but all the foodstuffs named prior to it remain my favorite meal in life. The smell of bagels toasting in the kitchen, especially on Sunday, has remained intoxicating to me ever since. 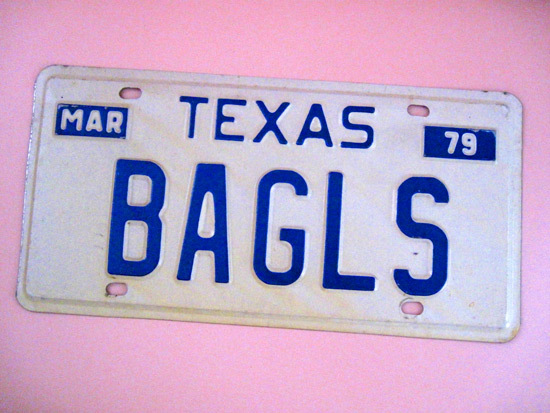 Had I lived in Texas in 1979 I would only hope that this would’ve been the license plate slapped on the front of my ’55 DeSoto. Seeing as it belonged to someone else I can only assume they had similar such love for the Jewish baked good by giving it such props as to adorn their car with it.